Is Carpet Flooring Good for Pets? Whether you are constructing a new home or you are planning to renovate or remodel your existing house apartment, it's important to choose the right flooring material. And, for pet owners that are having cute little animals in their home, the decision of choosing right flooring becomes even more critical. So, you must be wondering what types of flooring can be ideal for pets? Well, among the available flooring choices and options, the carpet flooring is considered to be one of the most pet-friendly flooring types. 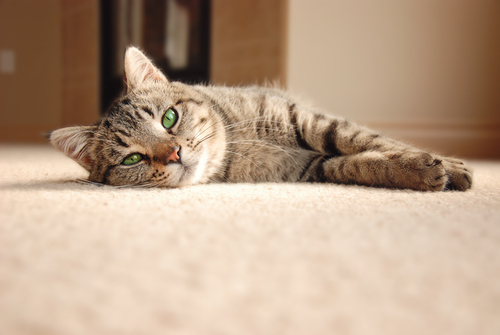 Your pets will simply love the warmth, softness, and comfort of carpet flooring as much as you do. In fact, pet-friendly carpets will further help the homeowners to easily clean and maintain the flooring. 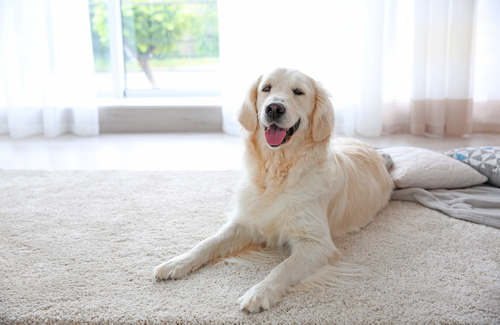 If you are a pet owner who is looking forward to installing a carpet flooring, you should primarily focus on two main priorities, such as durability and stain resistance. Needless to mention, your four-legged furry friends typically spend most of their time, while simply lying on the floors. Plus, they will continuously cause extensive wear and tear on the floor surface including scratches, stains, and dirt. Thus, your carpet flooring needs to offer an optimum durability. Additionally, it should be stain resistance so that it does not accumulate the instances of scratches, stains, and/or dirt. Now, you must be quite perplexed about why carpet flooring is considered to be good for your pets. Well, there are many reasons that prove why this kind of home flooring can offer great benefits to individual homeowners and their beloved pets. 1. Warmth and Comfortability: As a pet owner, you should always want your furry friends to enjoy a sheer comfortability and coziness. Aren't you? Well, you will be glad to know that wall-to-wall carpeting is extremely comfortable for pets. Since your pets spend loads of time lying and/or roaming on the floor, it's important to offer them a comfortable home flooring. Not only carpet flooring is soft and comfy, but also it offers a pleasant surface to walk on (particularly in bare feet). Furthermore, this kind of home flooring can help saving energy by insulating the indoor environment. For an example, carpet flooring insulates the floors and it renders a psychological feeling of warmth. And, your pets will definitely enjoy the warmth and coziness of such flooring. 2. Slip Resistant: As you probably know that the footpads of your pets often tend to slide on slippery tiles and hardwood flooring. Thus, it's essential to offer them a non-slip surface on which they can freely roam around. Luckily for you, wall-to-wall carpet flooring features to be slip-resistant. Furthermore, this kind of flooring is pretty safe for animals as it reduces the occurrences of slip-and-fall accidents. 3. Carpet Flooring Absorbs Sound and External Noise: Carpet flooring features an outstanding sound absorptive capability. In fact, no other flooring materials play the dual roles of efficient floor covering and a versatile & useful acoustical aid. Nevertheless, carpet easily absorbs airborne noise as effectively and efficiently as any other specialized acoustical material. According to scientific researches, this exceptional sound absorber (carpet) can reduce the sound of external noise by 24-35 decibels. Whereas, a conventional laminate flooring can reduce the surface sounds by 1-6 decibels. On top of that, carpet flooring not only reduces noise from the living space itself, but also it absorbs the noise of external environments too. The reflection time for sound waves or reverberation time in a carpeted room is almost halved, as compared to a room having hard flooring. Thus, a carpeted floor covering creates a soft and tranquil atmosphere and it even makes your home a blissful and peaceful place to live with pets. 4. Appearance and Style: Carpeting greatly enhances the overall decor of your homestand simply by its unique design patterns, bright colors, and pile heights. Hence, carpeted floor covering helps you create/flaunt a well-decorative flooring for your home. Not only carpet flooring offers a chic, fashionable, and exquisite appearance, but also it allows you to choose your preferred carpeting style. With thousands of patterns, cuts, and color options, there are endless numbers of possibilities to fulfill your style statement. Depending on the style and material of carpets, it can offer either a formal look or casual look. Many Singaporean companies offer an outstanding variety of textures, design patterns, color options, and styles so that you can perfectly decorate your living space with a beautiful carpet flooring. • Carpet flooring features to be warm, cozy, and comfortable that is ideal for pets. • It is slip-resistant and it reduces the incidents of slip-and-fall accidents. • Carpet flooring is safe and pleasant for animals. It offers a soft landing surface for pets. • It absorbs the external noise and makes your homestead a quiet and peaceful place to live with pets. • With thousands of color choices, design patterns, and styling options, you can easily choose an ideal carpet to cover the floors. Cons: Traditional carpets can be quite tricky with pets mainly because all the furs of your pets will be trapped within the carpet fibers. Over the time, carpet flooring will further accumulate dust, dirt, and debris. To overcome such problems, you should ideally purchase/use pet-friendly carpets. 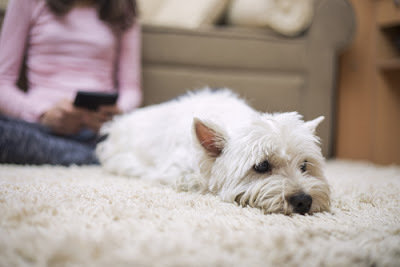 For an instance, pet-friendly carpets and cushion systems reduce odors, release pet hair, and resist stains. Plus, you can even use hydrogen peroxide-based cleaners (if required). The pet-friendly carpets that are manufactured and designed by reputed Singaporean companies use proprietary technologies & chemistries which reduce the force of attraction between the carpet and pet hair, allowing it to be easily cleaned by normal vacuuming. The decision about what kind of flooring works best for your pets depends on multiple factors, such as warmth and comfortability, slip-resistant surface, durability, ease of installation, and much more too. And, a good quality carpet not only enhances the beauty & comfort of your house, but also it offers a soft and safe landing surface for pets. Now, take your time to analyze the aforementioned pros and cons before installing a carpet flooring for your home.